Since becoming a mum wipes have become an essential part of our everyday life as they have so many uses. When you have a newborn though it isn't recommended to use wipes to begin with and just use water and cotton pads. I really wish I had known then about WaterWipes when Blake was newborn. WaterWipes are the worlds purest baby wipe, they are chemical free and made of 99.9% water and 0.1% fruit extract. 97% of midwives believe that they are suitable to be used on delicate newborn skin. WaterWipes are the only baby wipe to be approved by Allergy UK and the National Eczema Association of America. Even though Blake is a toddler WaterWipes are still suitable not for just cleaning bums, but for keeping hands and face clean. If your toddler is anything like Blake than they will get messy very easily not just when it comes to eating but everyday playing as well. 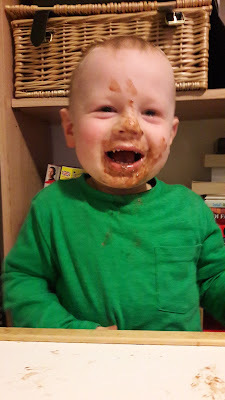 WaterWipes have become an essential over the last few weeks we have used them when it comes to nappy changing time, cleaning him up after eating, cleaning up after messy play, cleaning up snotty noses when I've not had a tissue to hand are a few ways. I love that they are such great quality too and aren't flimsy and they don't tear easily either which is handy. Each pack contains 60 wipes and there are also handy travel packs with 10 wipes in which I pop in our changing bag. Do you use WaterWipes? Have you used them on Newborns? I've not tried water wipes before but was actually looking at a pack at a friends house, they sound so much better than many other wipes! Even though my kids are now 9 and 11 I still use baby wipes for all sorts of things - haven't heard of these though so it's great to discover something new! We absolutely love WaterWipes at home. I'd never heard of them until 4 years ago when my 3rd baby was diagnosed with severe allergies and eczema. The dermatology nurse told me I had to stop using wipes, or move to WaterWipes. WaterWipes it was from then on! More expensive, but so much better than any other wipes! I have heard good things about these wipes before. I may need to give them a try as wet wipes are handy to have around! I don't have children so I am not familiar with this brand. However, when I travel I do bring with me baby wipes because they are very handy in a lot of situations. I like the sound of WaterWipes being so natural. water wipes are a bit pricey but I always use them for the first few months because I love how gentle they are on newborn skin. I've never tried waterwipes before i have tried various other wipes though on my mini ones. I haven't used waterwipes before I used another well known brand on my little ones as it was the best I could find when I was researching. We use Water wipes and love them. They are the only wipes I trust on my little one's delicate skin. I have used these before and thought they were great. they dry out quickly though! I may not have a newborn any more but I still can't live without wipes. Water wipes sound great. I didn't know that wipes were not reccomended for newborns. I used them when my babies were born and they worked out okay, I was in love with the convenience they presented and later I used to use them for many other things. Haha yes Blake needs those wipes. I have never tried these wipes before. Heard a lot of good things about it. I've never heard of these wipes, but they seem like a great product! Just bought some of these yesterday! My kids aren't babies anymore but I like using them too because they are pure! I've never heard of these before! I think it's awesome that they are so natural. These are amazing. Monkey has multiple allergies and eczema and these were the only wipes we could use during a flare up. My fella's sister goes through literally hundreds of these with her little ones! These sound really good, a great idea for newborns. I am the Water Wipe queen, I absoluetly love these little gems and carry them wth me everywhere. o chemicals and nasty's are brilliant for the whole family to even use. They sound ideal with having such high water content. I bet they're great for baby skin. I am not a mom yet, but these sound like they are pretty good. I used them on my smallest when she was born but stopped after a few weeks. They are very expensive. I've not tried them but will look out for them now as I always carry wipes with me.